Discover interesting facts and information about the weapons, including Ball Clubs, used by Native American Indian tribes. Description and Definition of Ball Clubs: There were two distinct types of weapons referred to as Ball clubs that were used by Native American Indians. The names of the ball clubs were the Stone Ball clubs that were used by frequently used by the early Plains, Plateau and Southwest Native Indians and the wooden ball clubs that were particularly favored by the Huron and Iroquois tribes. Stone Ball Clubs was primitive but lethal weapons that was used to strike and opponent with force. Stone Ball Clubs consisted of a relatively free-moving roundheaded stone that was covered in heavy buckskin or rawhide and attached to a wooden handle. Stone Ball Clubs varied in size but was generally smaller than the wooden ball clubs. The Stone Ball Clubs were widely used as a weapon across North America dating back to pre-historic times. The Stone Ball Clubs were used as simple, but effective, close contact weapons used for bludgeoning an enemy using a swinging action. The stone ball head was made from a suitable piece of hard stone such as flint, chert, jasper, chalcedony, granite, basalt and sandstone. Hard rocks of a suitable shape were also selected from riverbeds that served as suitable ball heads. The stone ball head was covered in heavy buckskin or rawhide and attached to a pre-prepared wooden handle using sinew as lashings to attach the stone ball to the club. The handles of the stone ball clubs were made with hard wood or different types of bone including the whale bone. The hard woods used to make the handle of this type of club included hickory, juniper, oak, cedar, maple, ash, walnut and birch. The handles were often decorated with paint and carvings on the handle and were also embellished with feathers and beads. 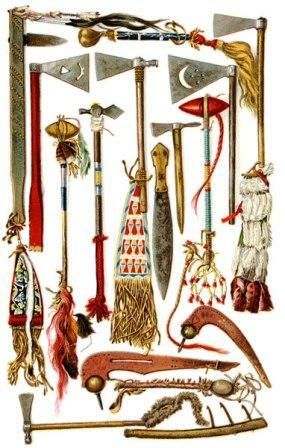 The Wooden Ball Clubs that were favored by the Huron, Mohican and Iroquois tribes. The wooden ball club could measure up to two feet in length and the head a mind blowing 5-6 inches in diameter. 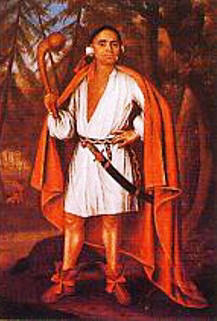 The wooden Ball Clubs was a highly effective striking weapon of the Northeast Native Americans. 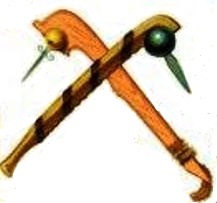 The Wooden Ball Clubs, also referred to as Ball-headed wooden clubs or Fixed Ball Clubs, was used to deal blows with the hand rather than by throwing. The Fixed Ball Clubs were usually made of beech wood from a sapling that grew out horizontally and upward from a riverbank, preserving the natural curve of the club without cutting across the grain and reducing its strength. 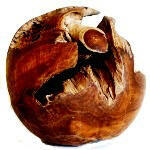 the root-ball of the sapling provided the round mass of wood for the ball head. The wooden clubs were made by craftsmen who took great pride in their work. The head of the wooden ball clubs were carefully decorated and embellished to produce unusual effects such as carvings depicting the round head of the club in the grasp of an animal being held in the talons of a bird or in the mouth of a predator. The handle was also elaborately carved and decorated with representations of animals and birds which were believed to invoke the spirits of nature. Other carvings depicted creatures that featured in mythology such as the Thunderbird and the Horned Serpent. Other carvings depicted arrows, bands or crosses indicating the number of kills or coups of the warrior. There were variants to the basic style and design of Wooden Ball Clubs. The variants would typically be the addition of blades to metal ball heads. These additions and variations were added in the 1600's using European technology when the wooden ball head was supplemented by iron, steel, copper or brass metal heads to which lethal blades or deadly spikes were attached. The Ball Clubs weapon. Discover the interesting facts and information which relate to the History of Native Americans and the weapons they used such as the Ball Clubs. The pictures on this site show the weapons and tools that were used by various Native Indian tribes that can be used as a really useful educational history resource for kids and children of all ages. We have included pictures and videos to accompany the main topic of this section - Ball Clubs. The videos enable fast access to the images, paintings and pictures together with information and many historical facts. All of the articles and pages can be accessed via the Native Indian Tribes Index - a great educational resource for kids providing an unusual insight into their culture. We hope you enjoy watching the videos - just click and play - a great resource for gaining facts and information about the life of Native American Indians.